Awesome Supplements — Introducing Magnesium! Mercury toxic people need help. Mercury is interfering with the biological functioning of their bodies in a very fundamental way. No, scratch that. Mercury isn’t messing them up in one single way–it’s messing up the way bodies process and relate to dozens of different vital substances. I’m not going to talk about them all in this post. I’m just going to focus on one really really important relationship that mercury loves to screw up. That is our relationship with the mineral magnesium. Magnesium is a part of all of us. We eat in every day in wheat, nuts, beans, dairy, fruits and vegetables. It’s everywhere. It helps us absorb calcium to keep our bones and teeth strong, it is vital in the healthy functioning of our muscles and nervous system, and down in the microscopic processes that happen inside our cells, magnesium is playing vital roles that we can’t even imagine or understand. Magnesium keeps us healthy and happy, so we’re lucky there’s so much of it around. But then mercury comes along. Mercury poisoning is famous for messing up a body’s relationship with the minerals it needs to survive. When mercury enters the picture, a person who is eating plenty of magnesium in their diet can inexplicably start showing signs of magnesium deficiency. They develop strange muscle cramps and twitches, their blood sugar control is off, they experience pain, both physically and emotionally. Headaches, depression, crankiness, there’s a lot of misery as mercury starves the body of essential magnesium. So it makes a lot of sense that magnesium is one of the top supplements for mercury poisoning. I can personally vouch for magnesium’s awesomeness. 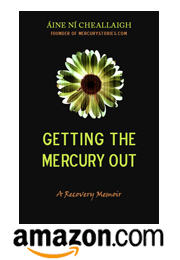 Getting on magnesium was a big turning point for me, even before I had a clue that I was mercury toxic. At the time I didn’t know why magnesium fixed up so many of my problems: constipation, depression, fatigue, headaches. But now that I know I was starving for magnesium because of mercury poisoning, it all makes sense. I’ve been on magnesium for years, and have tried it in basically every form it comes in. I highly recommend them all. Some, of course will work better for certain issues. Magnesium Oxide is excellent for those who suffer from constipation, as many mercury toxic people do. Only a fraction of it is absorbed, so the rest stimulates the action of the intestines as it moves through your digestive system. If that wouldn’t be helpful, then the more readily absorbed orotate, malate or citrate forms are better. Epsom Salts are a wonderfully soothing way to absorb magnesium through the skin. Add a cup to a warm bath and soak your aches away. This is an ideal way to absorb magnesium for those who have trouble with swallowing or digesting pills and capsules. And if baths sound like too much hassle, there is a super-convenient way to absorb magnesium–in a spray! Just spritz magnesium oil on your skin and you’re good to go. However you decide to take it, I strongly recommend giving magnesium a try. It’s one of those supplements that lightens the load, giving some much-needed relief from mercury toxic symptoms. Did you ever experience hot swelling of your extremities when you had mercury toxicity? Wondering because I had taken Amoxicillin for a dental procedure and had a very bad reaction…(reaction never ceased after 2 months)…then I took some MSM supplements and the hot swelling came back full force. Antihistamines do nothing to control. I ask because I hear “sulfur” binds to mercury…and with all of the unexplained things going on in my body…thought there could be a connection. I’ve had a lot of weird stuff, but I don’t think I remember having hot swelling of my extremities. I hope it clears up soon…!